Collecting for 2013 – What Songs are Commuters Listening to? The music that people listen to when they travel by Underground affects their experience of the journey. As part of the Museum’s contemporary collecting project for the 150th anniversary of the Underground in 2013, a group of Museum staff and volunteers spent an afternoon at Tooting Broadway station, stopping any passengers with headphones and asking them what song they were listening to. People of all ages gave us examples of music from a range of music genres, allowing us to get a real insight into the music that people listen to when traveling on the Tube. Responses from over 100 people were captured on film, and will be edited together for the Museum’s collection. Big thanks to our young consultants Adelah and Godwin for their hard work on the day (and for Adelah’s excellent dance moves with some of the commuters!) and to Jen and Wei, two interns who also helped out and did an amazing job. The finished film will be on the Museum’s YouTube channel soon. We’re excited about the showing of the 1928 film Underground at the Barbican next week. It’s been restored by the British Film Institute with music played by the BBC Symphony Orchestra. I’m really hoping that it’s going to feel as atmospheric as this gorgeous poster by Charles Pears which was produced a couple of years after the film in 1930. Posters like these were made to encourage people to use the Underground outside of the daily commuter rush hour. Do any film buffs out there recognise the film showing in the poster? We’d love to know if it’s from an actual film or if it’s the artist’s great romantic vision. 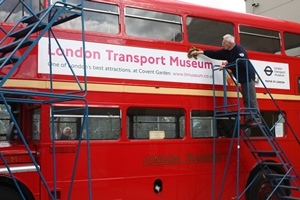 London Transport Museum benefits a great deal from voluntary support in all manner of areas, and without it we would not be able to achieve anywhere near as much and offer what we are able to offer without it. This was recently evident when a handful of volunteers stepped in on Wednesday 14th September to assist cleaning the RM1 vehicle at the Museum Depot at Acton in preparation for the upcoming Open Weekend in October. 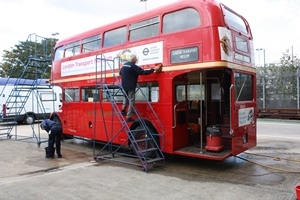 Ron Bristow, Malcolm Bowers, Fred Vincent and Gerry Pratchett were on hand to assist Robert Excell in getting the bus into ship shape both inside and out. With it being one of the most popular vehicles in our collection, it always receives lots of attention from the public, particularly at the Open Weekend when it will be ferrying passengers from our Depot around the local area. This week saw the start of a new project with a group from Oaktree Community Centre on the South Acton estate. Over the next 5 weeks we’re going to be exploring the museum’s collections online and at the Museum Depot in Acton. The group will be learning new digital skills and we’ll be finding out what they think of the collections. We’re doing it in partnership with Acton Community Forum who are part of a national “Community Capacity Builders” project which helps get local people online. The streets are full of fashionistas this week as it’s London Fashion Week. This ‘Simply Fashion’ poster was commissioned to promote the event back in 1999. The poster went alongside a special leaflet produced by Time Out. It was part of the ‘Simply’ series which included posters promoting markets, nightlife and showbiz. Just type ‘simply’ into our Poster Browser to see the rest of the series and their original art works. Do you recognise the inspiration behind this poster? The designers Tricket & Webb have taken the iconic poster by Man Ray in 1938 as their starting point. The surrealist artist transformed the London Transport roundel into the planet Saturn. Two versions of the poster were printed, one said ‘London Transport-‘ the other said ‘Keeps London Going’. Which poster do you prefer? With 3 other poster related blog posts last week, we thought we’d hold back on this one, so you’ll have 2 posters to enjoy this week! This one marks the start of our Access to Art poster transfer programme. Here at the museum we look after over 40,000 transport posters. Ideally we like to have up to 3 copies of each poster design which are officially part of the Designated Collection. However as the posters were originally printed in large quantities, there were sometimes more than 3 copies put in to the store. These spare posters aren’t being well used so as part of the Access to Art project, we’re transferring some of the spare copies to other organisations so that more people can enjoy them. The first posters to be donated have gone to Amersham Museum. They selected two posters which help tell the story of the local area. You can follow the journey of the posters from our museum store in Acton to Amersham Museum in our Away to Amersham Flickr set. Both the posters are from 1930s, when the Metropolitan Railway was encouraging people to move to the idyllic suburbs of north west London. Many posters at the time showed how easy it was to travel on the electric trains from the smoky city to the wholesome countryside. 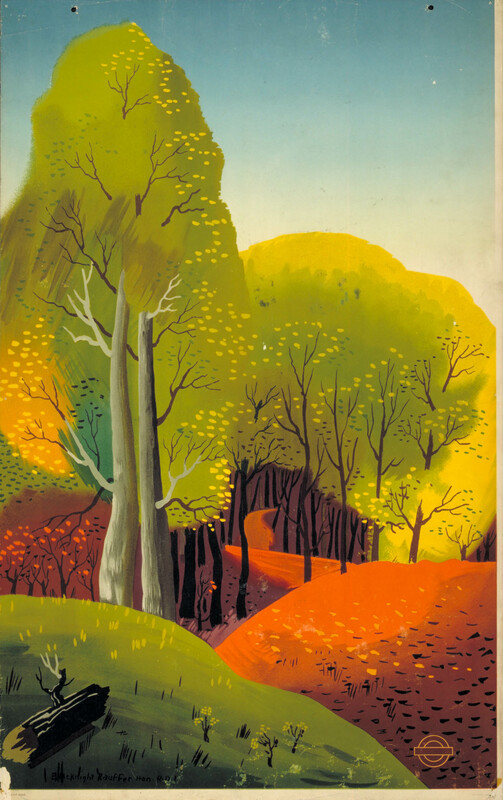 Away by Metropolitan is one of a pair of posters by Graham Sutherland which promoted a booklet called Chiltern Strolls and Rambles, which was sold at stations. The booklet included 9 walks which started from Amersham Station. 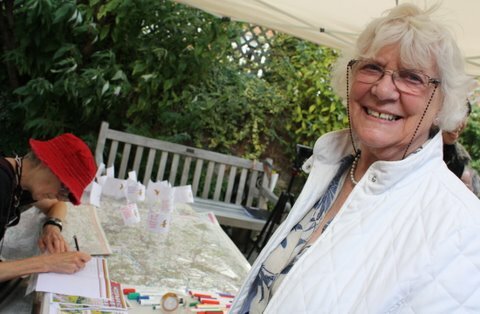 On Sunday we headed over to Amersham Museum to join in their Heritage Day celebrations and find out if the locals are still enjoying the countryside. 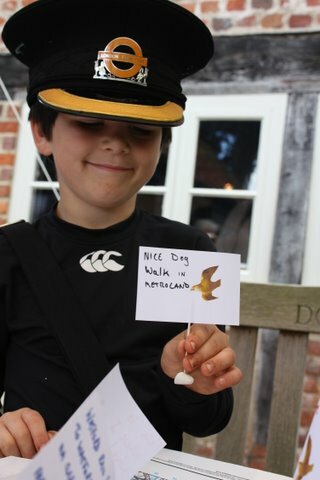 We asked people to tell us where they went walking and what they enjoyed along the way.We’ve put a few photos from the dayon our Heritage Day at Amersham Museum Flickr set. Thanks to everyone in Amersham who joined in – we had a great day! London Transport Museum receives many requests for loans from other museums. Loans must be agreed months in advanced to make sure the requested items are available, are of a sound condition, that conservation requirements are met and to make sure all the relevant paperwork is completed in time for the exhibition opening. Last week, London Transport Museum received back 7 posters and 1 enamel sign that had been loaned by Brighton University for their exhibition, Out of the Shadows: MacDonald Gill, which ran from 22nd July – 31st August. The exhibition brought together the seven maps that MacDonald Gill created for London Transport with commissions from marketing and communications companies such as the Empire Marketing Board. His work is renowned for the great detail and the humourous captions that run alongside them. It was great to see so many wonderful pieces by Gill brought together in one place! 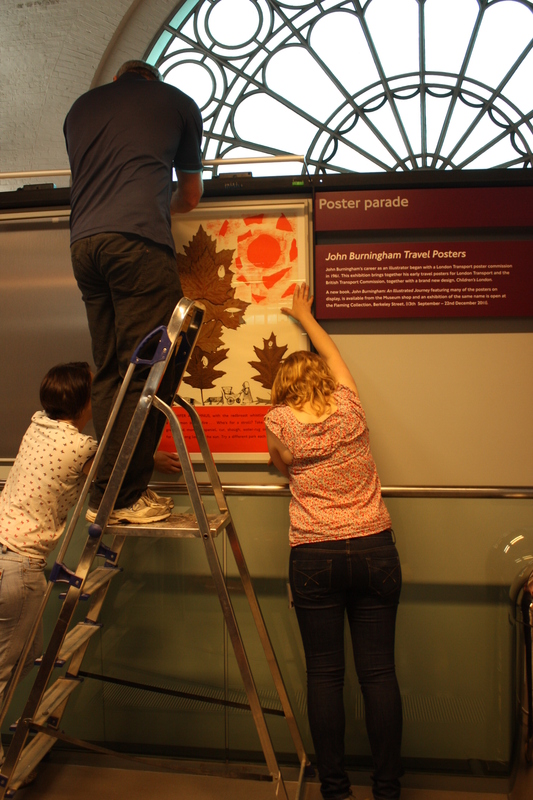 On Friday 9th September a team of curators and museum technical assistants arrived early at London Transport Museum to install the new extended poster parade, John Burningham: Journeys of Imagination which celebrates the transport related work of the renowned children’s author and illustrator John Burningham. Poster parades have to be installed early in the morning to be sure that everything is ready for the Museum’s opening at 11am. Today a larger team than usual assisted with the installation which included new features such as an introductory panel, a Flickr wall panel and floor graphics featuring a leaf design taken from one of the featured posters. The new poster parade, John Burningham: Journeys of Imagination, features 7 out of the 9 posters John made for London Transport in the early 1960s. These posters will feature with John’s rarely seen travel commissions made for other transport companies during the same period. Part way through the poster parade, a new commission by John will be installed. Children’s London was first commissioned by London Transport in 1968 but was never completed … until now. London Transport Museum has recommissioned this work which will go on display in the poster parade and will also be available for purchase from the Museum shop. The Fleming Gallery is also hosting their own John Burningham exhibition which will focus on John’s career as a children’s author and illustrator. 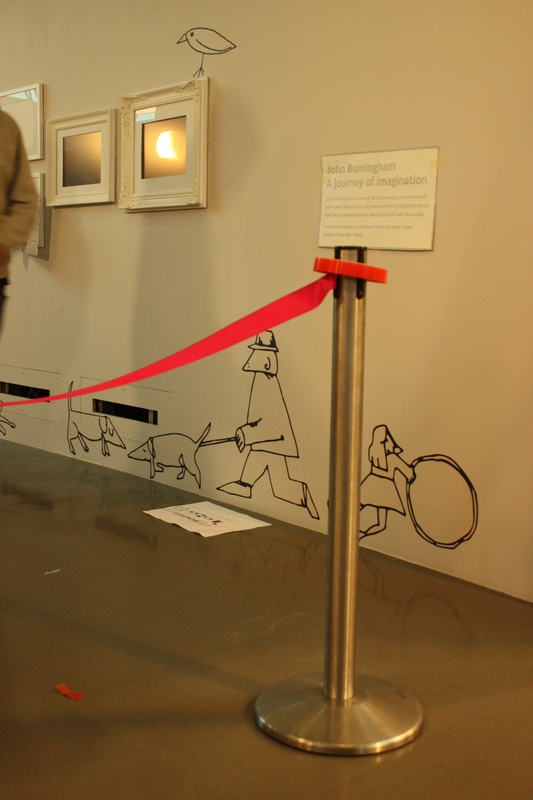 Their exhibition, John Burningham: An Illustrated Journey runs from 13th September to 22nd December. 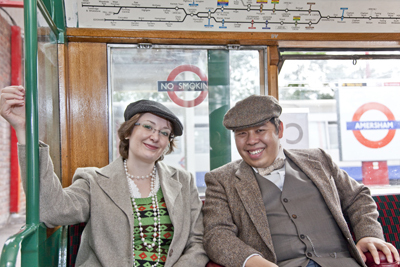 Being a Young Consultant at London Transport Museum is a great way to gain new skills in a working environment. Since April 2011 I’ve been a part of the Young Consultants at LTM, and already I feel like I’ve gained a wide range of skills. One of the projects I did as a Young Consultant was at Coram’s Fields Youth Centre, where I was able to speak to other young people about work experience. This was to help them understand that there are different ways to gain as well as improve their skills. It was a great way to share a personal testimony on the skills I’ve gained, and how I became a Young Consultant at LTM. 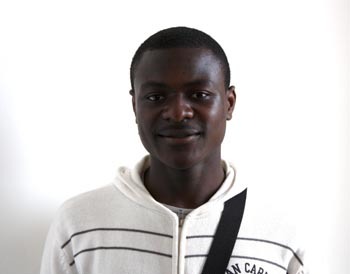 As I am about to leave LTM and move on to study at Coventry University, I want to take this opportunity to let other young people know that the journey they take will not be easy but when they look back at what they have achieved, they can be proud of themselves. If there is an opportunity grab it, because you’ll never know when the next one will come. London Transport Museum’s Poster Collection is one of the most sought after in terms of loans requests the Museum receives. A loan must be agreed months before an actual exhibition opens to ensure that all the relevant paperwork has been completed. This week, London Transport Museum has sent out seven posters and three artworks by one of London Transport’s most prolific artists, Edward McKnight Kauffer. The posters and artworks are being loaned by the Esoterick Collection of Modern Italian Art, who are holding their exhibition, The Poster King: Edward McKnight Kauffer from 14th September to 18th December 2011. We are very excited to see this prolific artist’s work for London Underground exhibited with his other commissions such as those for Shell that he made during his time in England.